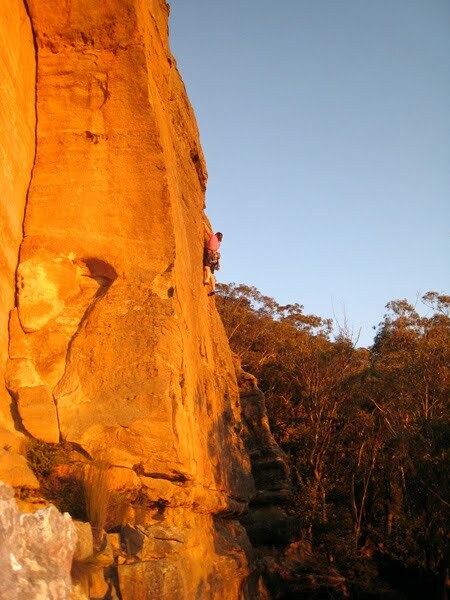 Mid April 2009: After a stop in the Australian sports climbing capital Nowra (which I didn't like particularly much), we had reached our final climbing destination: the famous Blue Mountains West of Sydney. We went to several single pitch cracks with Sofie which was great fun and it was great to be back on sandstone. 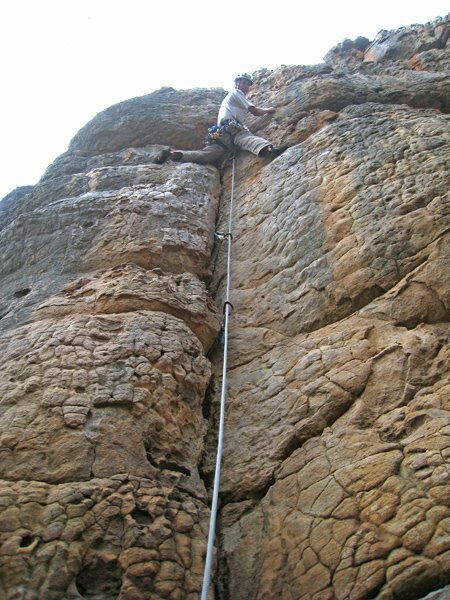 The most memorable climbs for me were the awesome crack line The Eternity (18) and the sustained face climb Auntie Jack (19) at Mt. Victoria. Hans leading the famous and awesome crack line The Eternity (18). 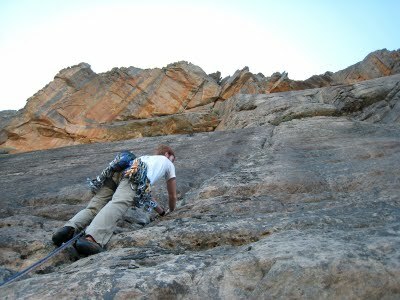 One of the most fun cracks I have ever climbed as it was very varied and kept you thinking from the bottom to the top! Elvira toproping Auntie Jack (19) in the sunset. A great line which however was a bit unnerving. It was protected by a mixture of carrot bolts and nuts/friends. According to my taste they could have thrown in a few extra blots! Also, a few bolts up I found out that my carabiners were too thin and the bolt plates could thus pop out of the carrot bolt!!! The infamous Australian carrot bolt system. Left you see the carrot bolt onto which you place a bolt hanger (right). 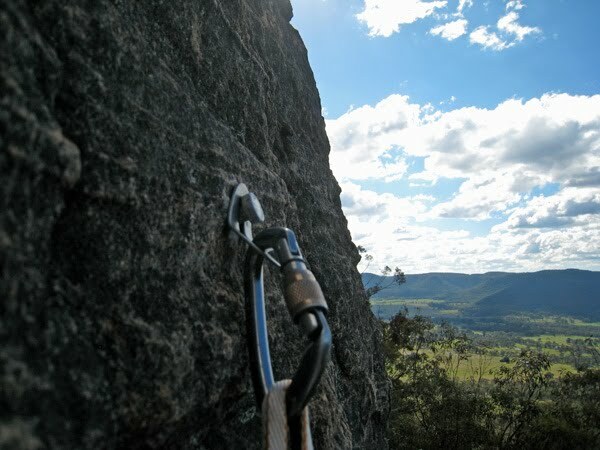 It is important to use carabiners which are big enough so the plate cannot exit the bolt during a fall. The carabiner was actually too small which I discovered while leading Auntie Jack - quite unnerving! Another beautiful sunset at Mt. Victoria! Unknown Aussie climbing Giggles (16), which was a nice route. 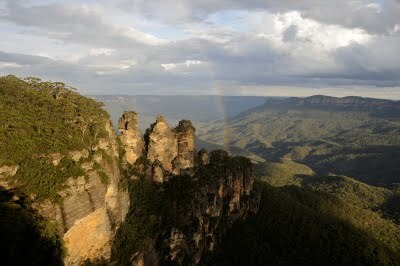 And finally, the most famous view in the Blue Mountains: The Three Sisters. After climbing Mt. Kosciuszko we drove to Canberra, the capitol of Australia, to visit Uncle Guy. 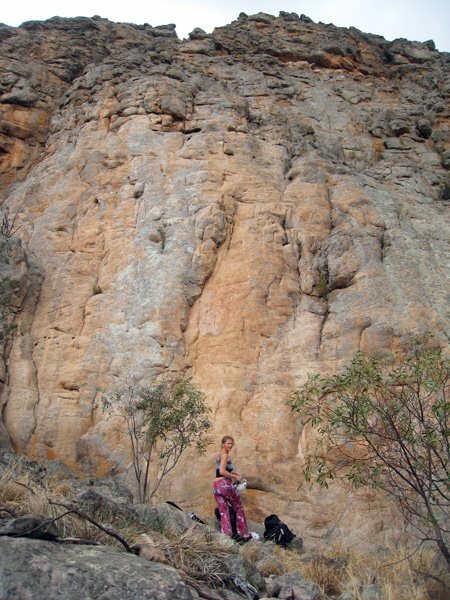 He was so kind to offer to take care of Sofie while we went climbing in Booroomba Rocks - a great granite slab just outside Canberra. In order not to waste precious time on the approach we actually go there with Sofie and Guy the day before the climb - it is also a nice hiking area. 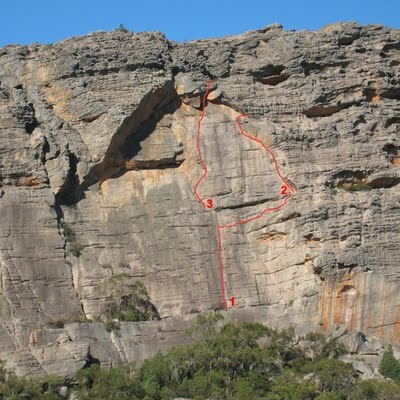 My goal was to climb the famous Integral Crack (48 m, 19+) which turned out to be an absolutely fantastic pitch! As it is stated in the guidebook "A classic by any standards. 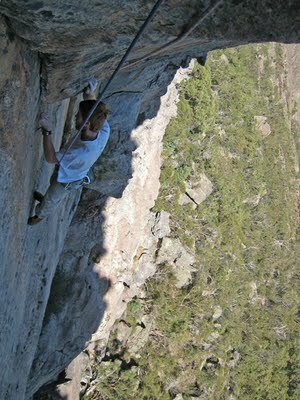 The best line at Booroomba..... with sustained face climbing and excellent natural protection". An excellent line which follows a thin crack in the solid granite. 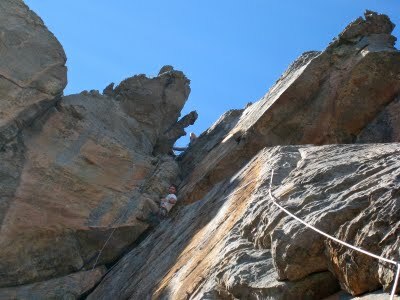 It is sustained throughout the 48 meters of climbing, which is a rare quality. Next, we climbed the line Roy's Crack (50 m, 14), 10 meters to the left, which is infamous for bad protection and has been the scene of one death and several serious accidents. I didn't find it that hard to protect but in particular the lower part was an awkward off-width crack, which I think could scare beginners and thus cause them to quickly put pro into less than perfect places. Anyway, I found the route to be a bit loose and vegetated and not near the quality of Integral Crack. A great way to welcome climbers! Sofie and Hans on top of Booroomba Rocks scouting the approach to the base of the climbs. 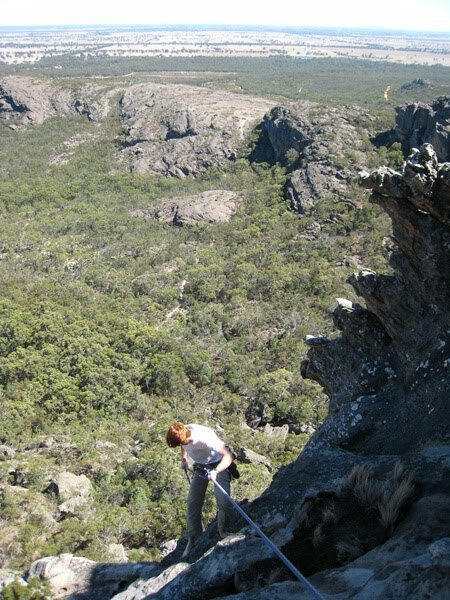 The South Buttress with Integral Crack in the middle and Roy's Crack to the left. 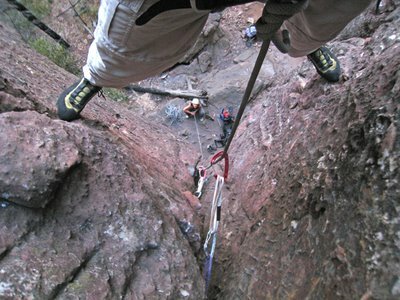 Hans leading Integral Crack - one of the best crack routes I have ever climbed! Hans just above the off-width start and approaching the vegetation on Roy's Crack! Mt. Kosciuszko (2229 m) is the highest mountain in Australia and has gained fame a one of the peaks of the original Bass list of the Seven Summits. Many mountaineers aspiring for the seven summits thus come to The Snowy Mountains to "climb" Mt. Kosciuszko. This is quite a joke given that it is a hiking summit which anyone with even a minimal degree of fitness can "climb". 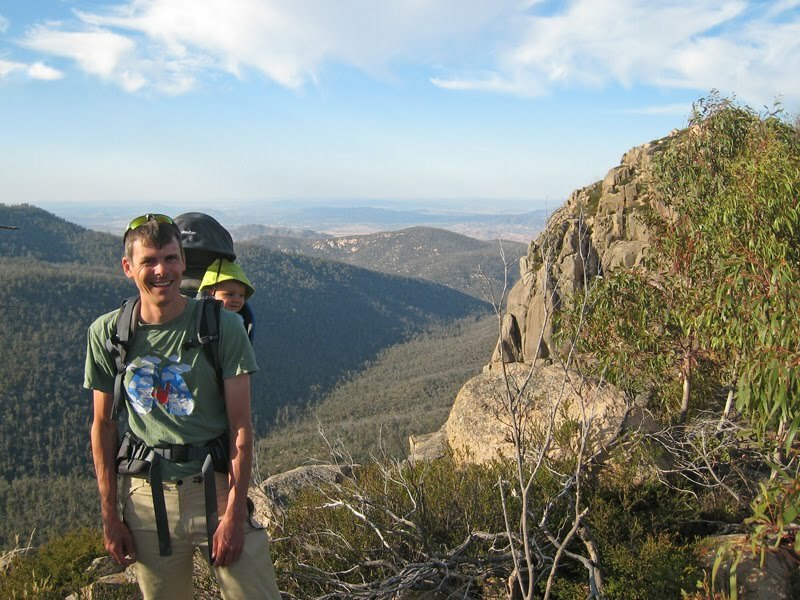 Nevertheless, it is actually a beautiful area as the alpine vegetation is quite unique (in particular the snow gum trees are beautiful), and it is thus a worthwhile hike - in particular if you come off season to avoid the massive summer crowds! 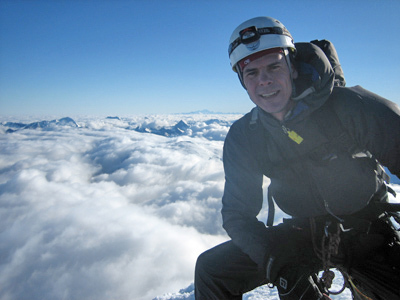 On March 26, 2009 Sofie Frederikke, Elvira and I hiked to the summit. It was not the best weather as it was quite windy, but we had a great day - and now Elvira and I have both climbed two of the seven (Mt. Kilimajaro and Mt. Elbrus, respectively), and Sofie has her first! Snowy Mountains seen from the parking lot. Mt. Kosciuszko is hidden in the clouds on the left. Mt. Clarke is the peak in the middle and Mt. Lee is the peak to the right. Closeup of the beautiful bark of a snow gum tree. Elvira pushing the pram with Sofie towards the summit. The Seaman Hut is located halfway between the parking lot and the summit. We took a break in the hut on the way down to get a rest out of the wind! On March 23, 2009 I got a chance to climb a multi-pitch route in Arapiles as David Morse and Jack Scott had found a partner (John) for me. 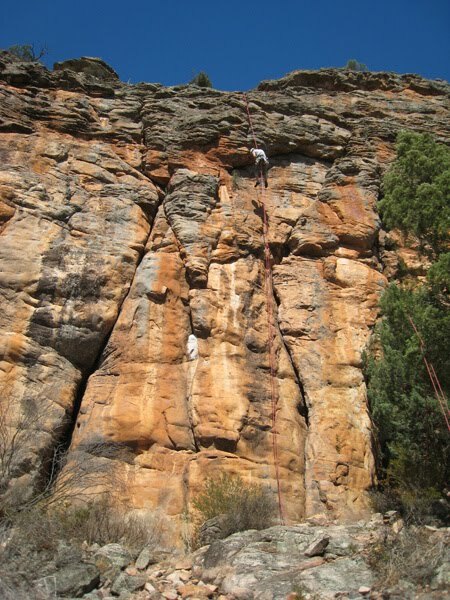 John turned out to be a great partner as he had climbed in the area since the sixties and thus knew more or less everything about Arapiles and The Grampians! We decided to climb a route on the famous Watchtower Face and choose the route Creon/Tales of Brave Ulysses (110 m, 18) which turned out to be a great route! The Watchtower Face. The Watchtower is the pillar in the middle of the picture. 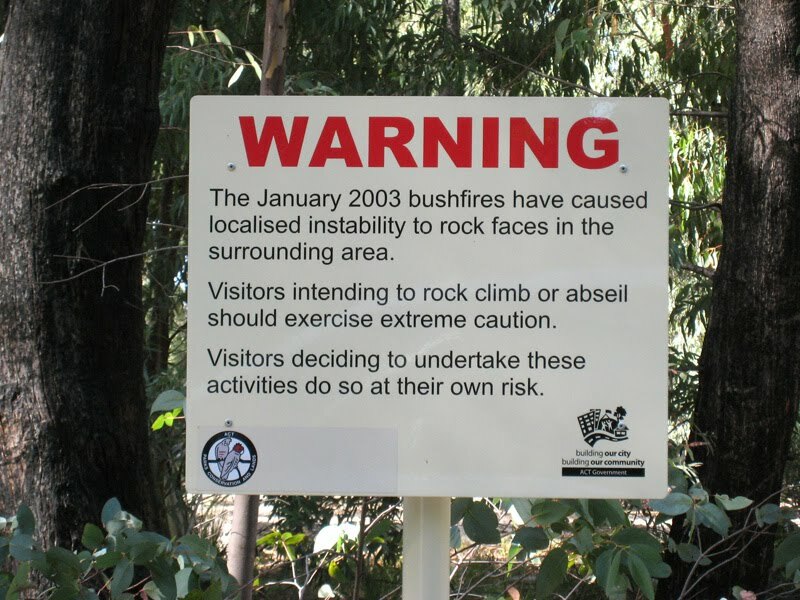 The "real" fire watchtower is seen on the top of mountain, which was actually were some of the terrible "Black Sunday" Victorian wildfires were spotted from on February 7, 2009. Closeup of the route on the left. 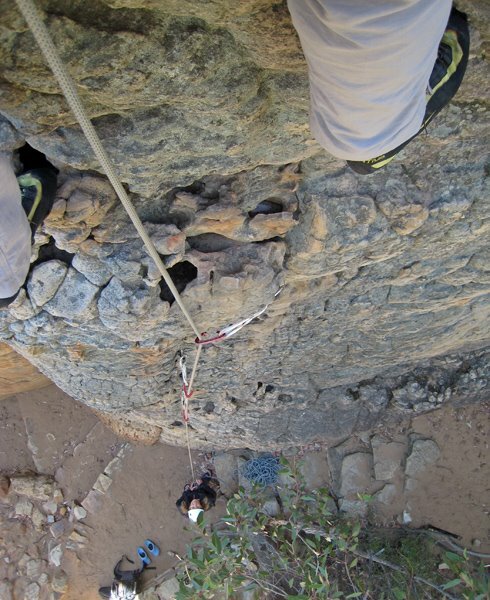 We also climbed a route on the Kitten Wall on the upper right side of the Watchtower Face. 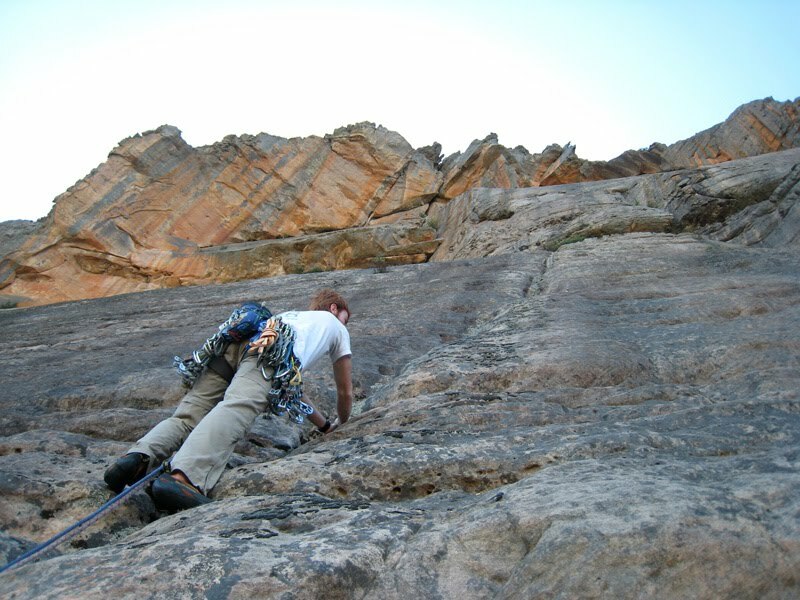 John leading the first pitch, which was a slab with an interesting traverse on flakes. I led the second crux pitch which goes up The Siren Buttress seen here. 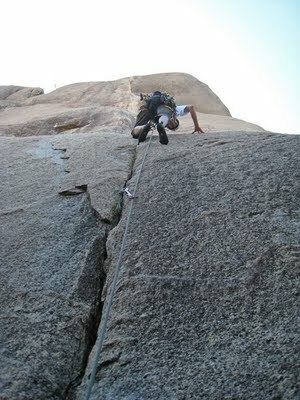 The crux was the initial overhang - after that the pitch got a lot easier. 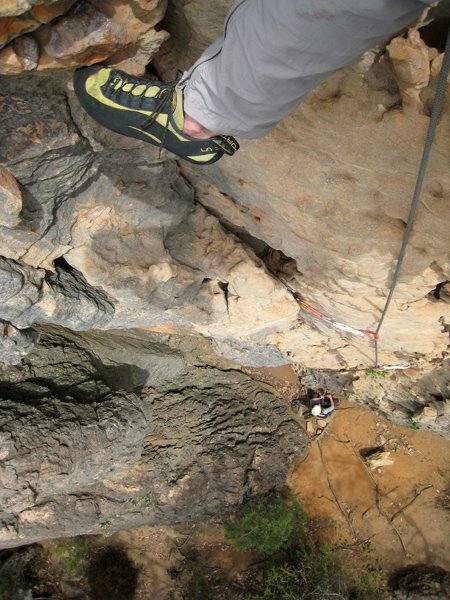 The last pitch is quite short (< 10 meters) going up an interesting crack corner. To get more out of the day I led an excellent grade 15 crack on The Kitten Wall which is located above the Watchtower Face. Here John is abseiling the route which goes up the crack to the right of the rope. 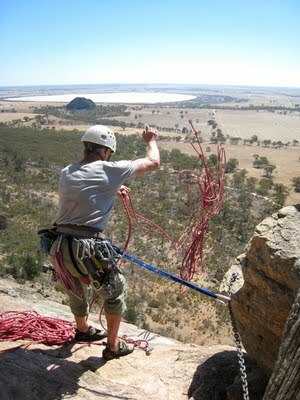 Finally, we abseiled the Watchtower Face with an excellent view of Mitre Rock and Mitre Lake. 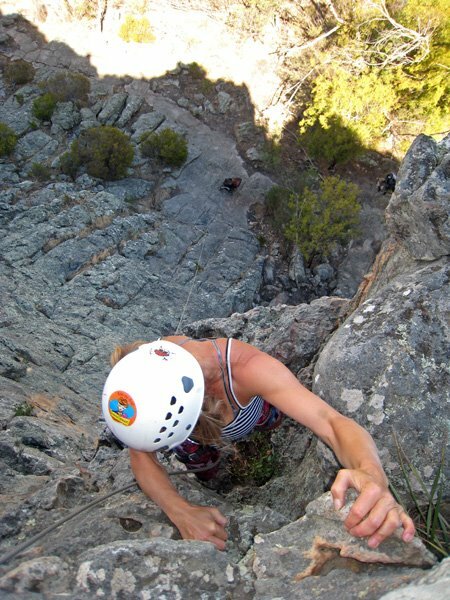 Both The Grampians and Arapiles are renowned for their trad protected multi-pitch routes, which is one of my favorite kinds of climbing. 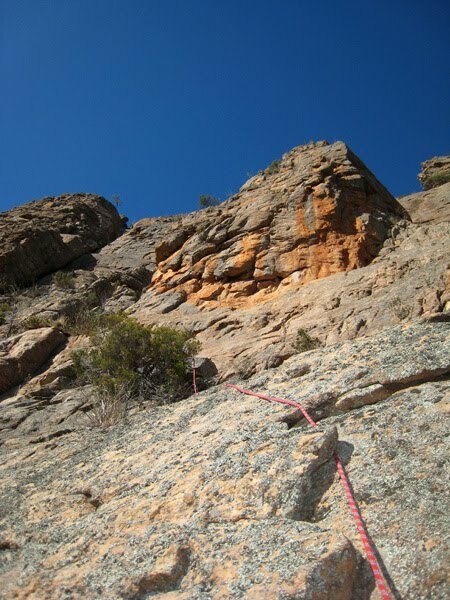 Unfortunately, it is not really possible to climb such routes with a baby onboard and I was thus lucky to bump into David Morse (Wales) and Jack Scott (Australia) in The Pines Campground, Arapiles. 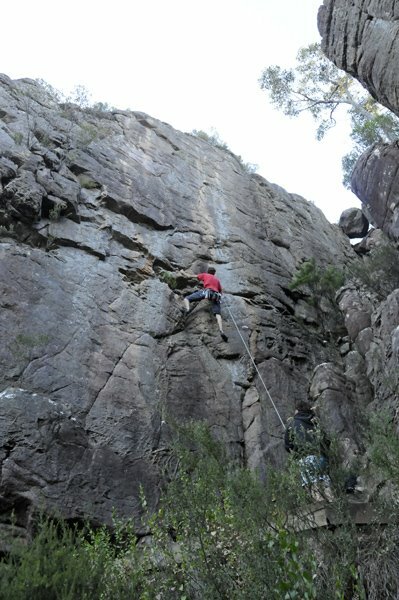 They were happy to bring me along on a multi-pitch climb in The Grampians as I had the car to bring us there - and they were psycked to try this area. On March 19, 2009 we thus drove to the Mt. 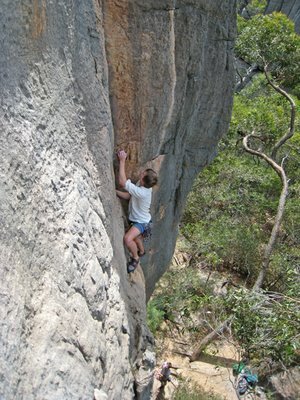 Stapylton area to climb on the Grey and Green Wall. It turned out to be a fantastic day with three great pitches in the most beautiful surroundings. David Morse on the approach to the Mt. Stapylton Amphitheatre. 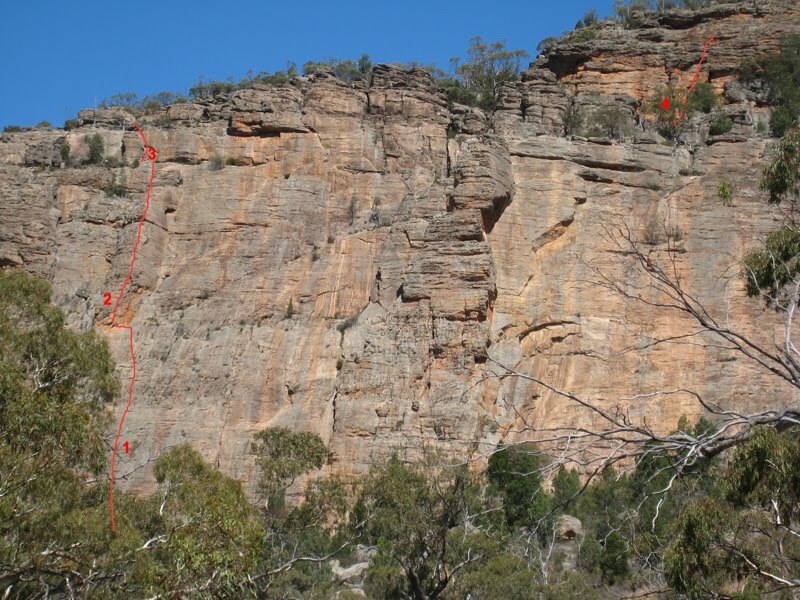 The famous (and very hard) Taipan wall is the orange rock in the right. The Grey and Green wall is just left of the Taipan wall. 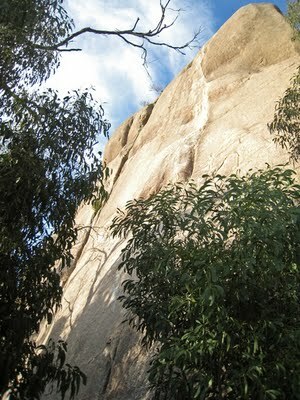 The forrest below the walls sports many boulders which are used for bouldering. 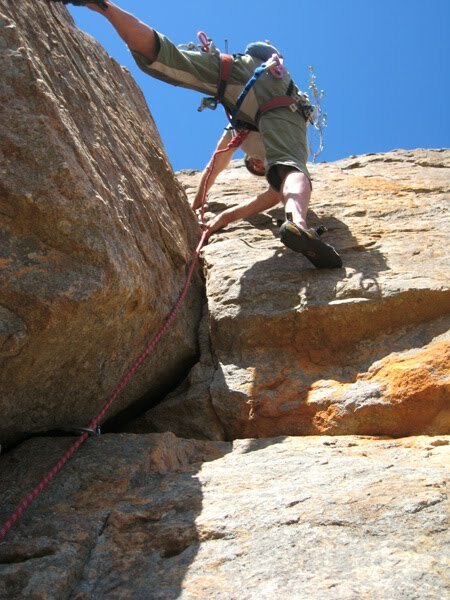 Here Jack Scott is praticing his off-width chimney skills on a funny looking boulder. Our first pitch was Spillway (18), led by Jack Scott, which was a slab route protected by the Aussie carrot bolts. Next I led the awesome pitch Navarre which followed a left-trending diagonal corner. I thus had my feet on small ledges on the wall while using the crack of the corner for my hands (and Friends!). Super position! Here Jack Scott is cleaning the pitch. 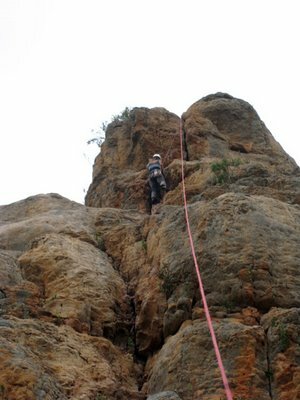 We had to abseil halfway down the wall to get to the start of Sweet Dreams. David Morse led the pitch which started out with delicate slab climbing without a lot of protection. 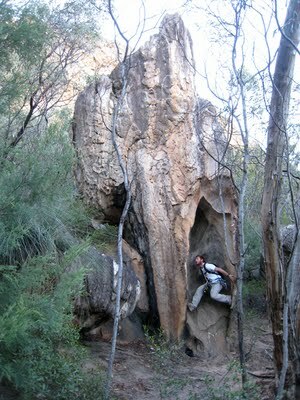 The route then changed character and became an overhang which looked quite hard. However, once you got the feet up on the overhang (as Jack Scott shows here) it was surpricing easy and a lot of fun due to a lot of hidden holds in the crack. 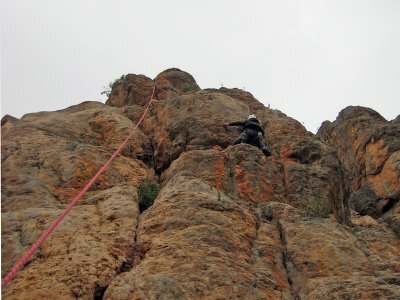 Jack Scott abseiling the wall. Great view with the approach route on Flat Rock seen in the backround. From the summits of the mountains in The Grampians one can see another mountain in the horizon rising out of the flat farmlands, which is Mount Arapiles. 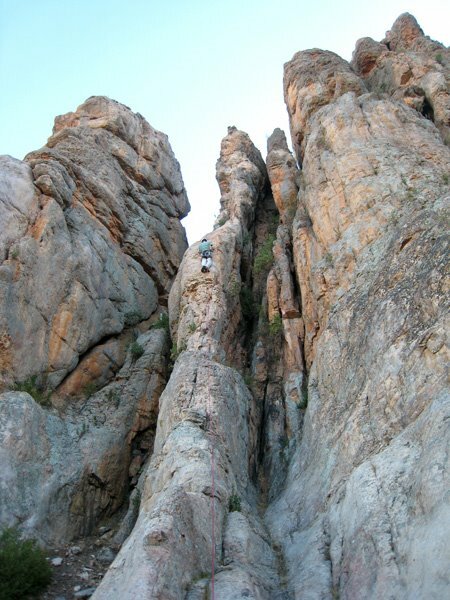 Arapiles is one of the most amazing places I have ever climbed. 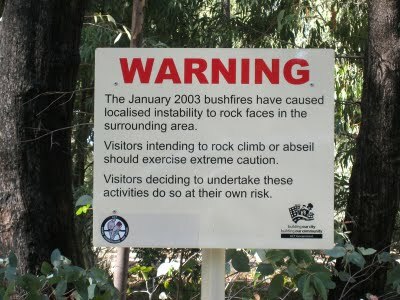 It sports around 3000 climbs that are almost all within 5-15 min walk from the road. 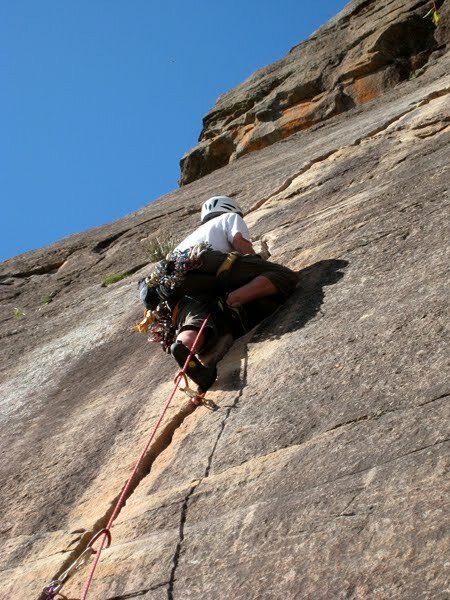 Although most of the best routes are multi-pitch and were thus not suitable for us with a baby, the area had plenty of single-pitch high-quality routes for the week we were in the area. Like The Grampians it is mainly a trad climbing area - small wires or RP's are a must - in particular on the harder routes. 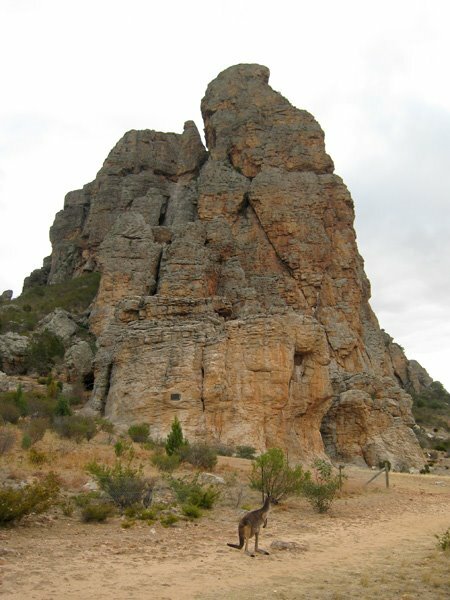 Arapiles is made of hard sandstone like The Grampians but was more broken and in some places more quartz-like. In my opinion, the rock quality at Arapiles was thus not quite as good as The Grampians, but don't get me wrong - it is still fantastic! Mount Arapiles, sporting 3000 climbing routes, is quite impressive as it shoots directly out of the flat Victorian farmlands. 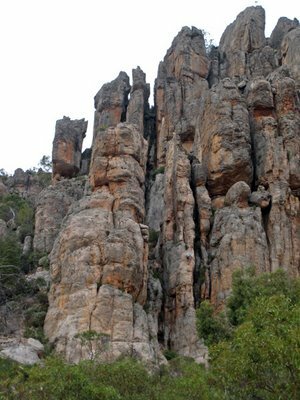 The Organ Pipes is a popular beginners area due to a variety of easy routes and its very close proximity to The Pines campground. 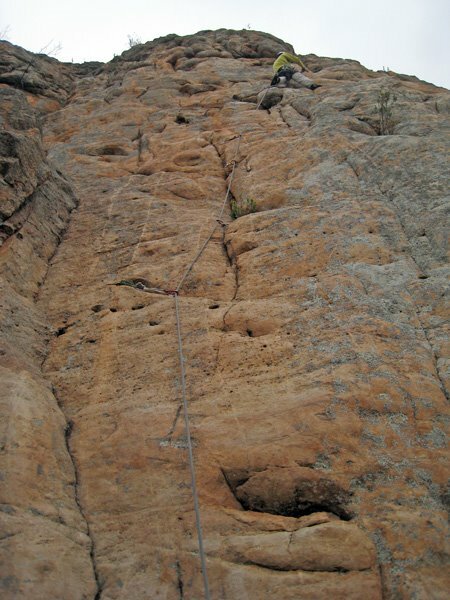 Note the climber on the middle and top of Piccolo (Australian grade 11, French 4) on the "pipe" in the middle of the picture. Hans at the crux bulge of Piccolo (Australian grade 11, French 4). 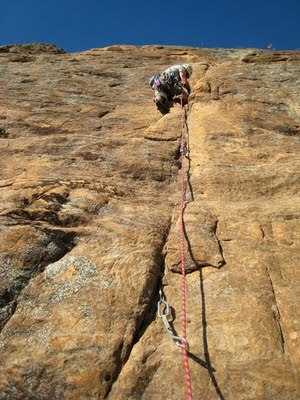 Elvira top-roping the first of two overhanging cruxes of D Minor (Australian grade 14, French 5). The route is the major crack seen on the left-hand pinnacle two pictures above. The route has three stars in the guidebook but I found it too unsustained to deserve that. 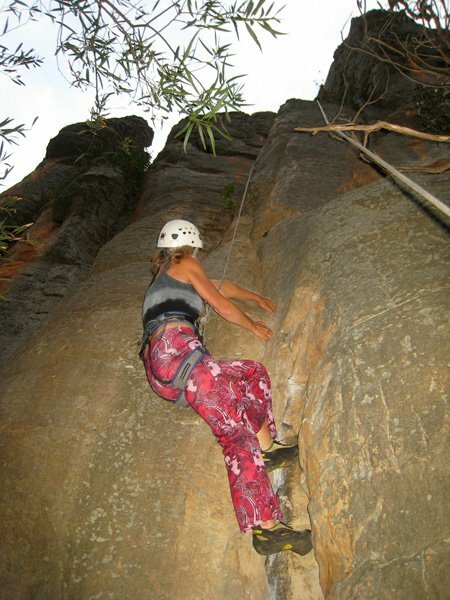 Elvira at the tricky traverse crux of Crescendo (Australian grade 17, French 5+/6a). All these routes were 35 meters long, so I just managed to set up a top-rope for Elvira on all three routes with our 70 meter rope! In this way one of us were always at the bottom of the climb with baby Sofie. 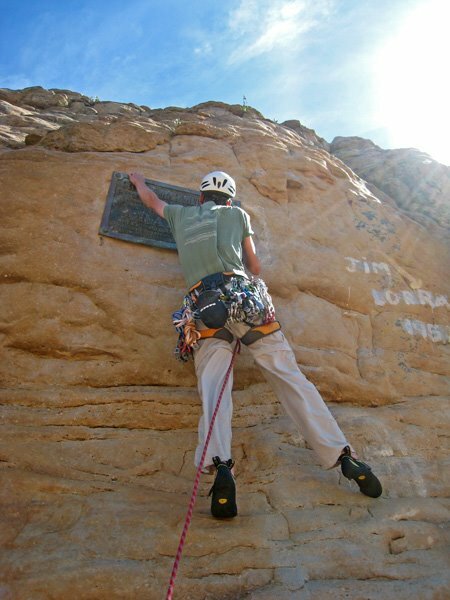 The Plaque Area is so close to the road that you can almost belay from the car! It was thus ideal with a baby. 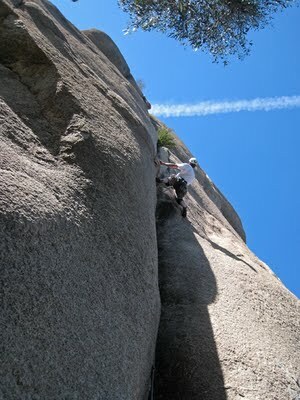 The routes are quite short (10-15 meters), but were on excellent rock and thus worthwhile. A wallaby was also checking out the area! 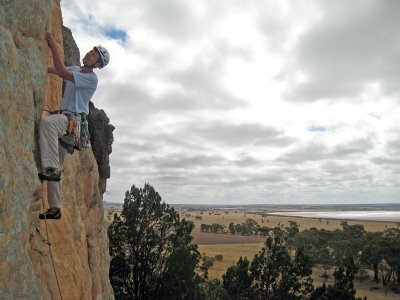 Hans leading Minimus (Australian grade 14, French 5). Elvira following on Maximus (Australian grade 17, French 5+/6a) - the best route we climbed in the Plaque Area. Hans leading Age of Reason (Australian grade 18, French 6a) - a novelty as the Plaque (giving name to the area) is part of the climb! The crux is to get from the plaque back onto the rock - a long and hard move! Mitre Rock and Mitre Lake (a salt lake) seen from Mount Arapiles. It is a small outcrop which, however, contains a number of good routes - many of which are single pitch and thus suitable to climb bringing a baby. Elvira below the Exodus Area where we climbed two excellent routes: Salem (the flake above Elvira) and Morgul Khan (following the right side of the red rock left of Elvira). Hans leading Salem (Australian grade 18, French 6a). 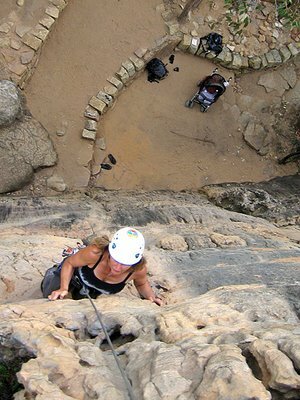 As the guidebook says ""Impeccable climbing up an exquisite line"! Hans leading Morgul Khan (Australian grade 18, French 6a). A good line but not as exquisite as Salem. 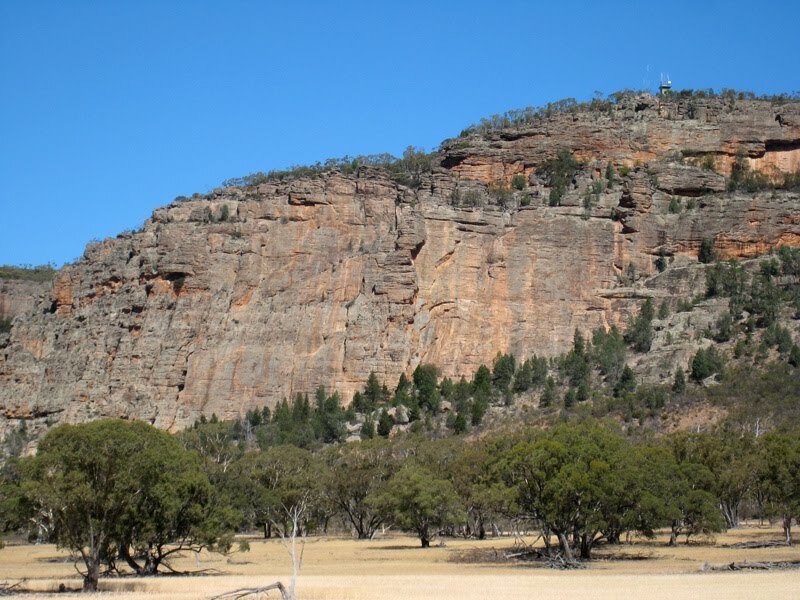 Bushranger Bluff is a small crag at the summit plateau of Mount Arapiles. The main wall is in the shade most of the day, and we thus took refuge up there on a very warm day. The climbing is very easy in this area, and thus a popular beginners crag as we quickly realized when we were met by a swarm of top-ropes and a climbing school! 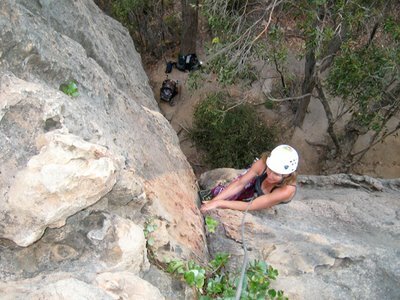 Nevertheless, we had a great and relatively cool day at the crag. Hans leading Sexless Sue (Australian grade 13, French 4+) which had a great overhang with big holds at the top. Elvira following The Ghost of Melville (Australian grade 13, French 5/5+) - the hardest route in the area! 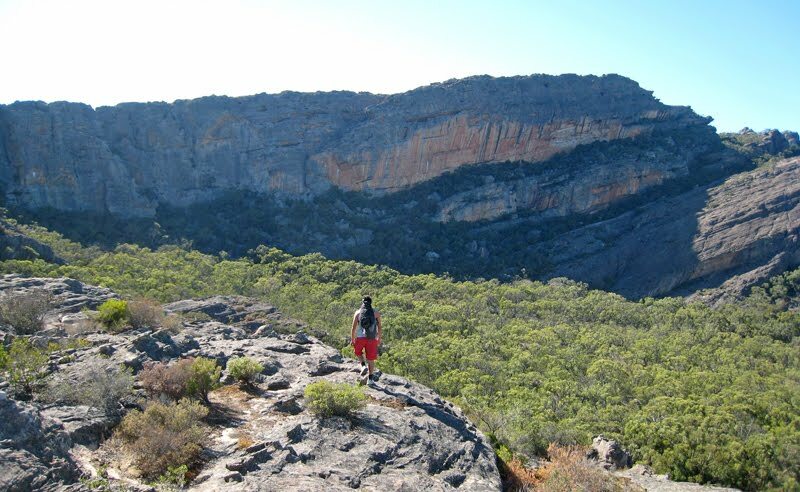 After climbing the dubious dolerite rock on Tasmania our next climbing destination was The Grampians. Having heard that this should be one of the best climbing areas in Australia I was pretty psyched! However, we were now on our own with Sofia and could no longer count on Auntie Gabrielle babysitting while we were climbing, so we had to restrict our climbs to areas with single pitch climbs and very easy access! After reading the guidebook and scouting some of the crags we ended up climbing in Sunny Day Valley and The Watchtower which both had 5 min access on good paths. We first went to Sunny Day Valley at Mount Hollow. 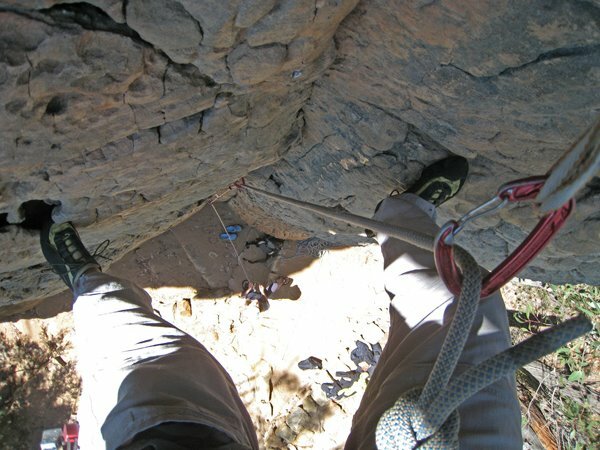 According to the guidebook this area should have high quality single pitch trad routes in all grades on perfect sandstone rock - and we were not disappointed! 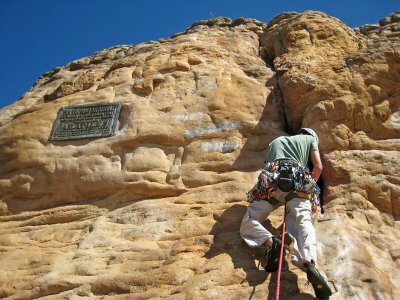 We started out climbing some of the easier routes to get familiar with the rock and then worked our way up to Australian grade 18 (French 6a). I immediately got totally psyched as the rock was soooooo good with nice pockets and cracks, super gear placements and excellent friction. 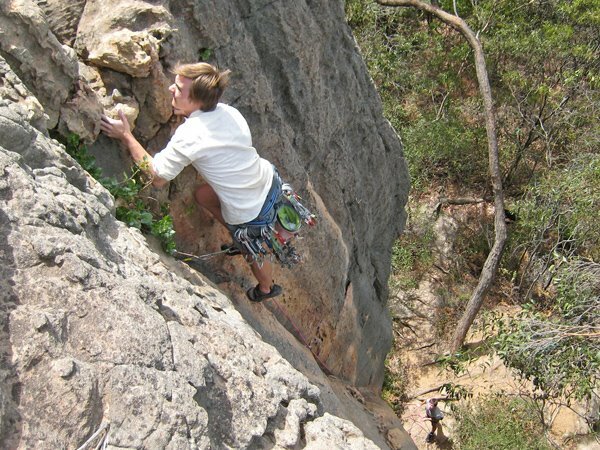 It was like climbing on sandpaper! A look down An-tics (Australian 10, French 3) - nice rounded jugs! Hans belaying at the top of An-tics. Note the awesome looking rock formations in the background. A look down the great corner of De Blanc (Australian grade 12, French 4). Hans leading the nice crack route Regatta (Australian grade 13, French 4+). Elvira at the crux of Overkill (Australian grade 17, French 5+/6a) - the best route we climbed on the Back Wall. A look down on Waxman (Australian grade 11, French 3/4). 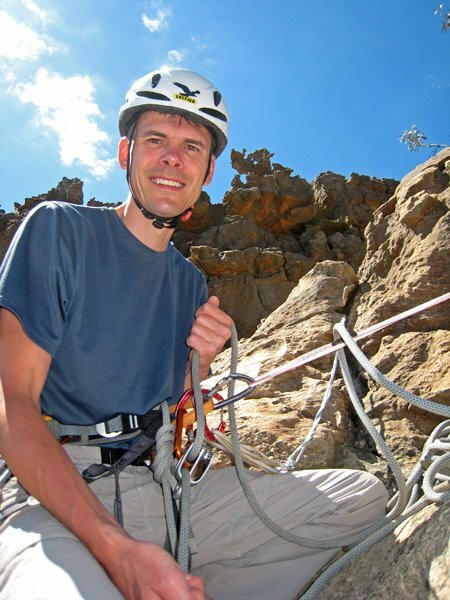 Australian Martin Grymel leading Texas Radio and the Big Beat (Australian grade 17, French 5+/6a) - the best route that we climbed on the Main Wall. Martin Grymel at the top of Texas Radio and the Big Beat. This was only his second lead on own gear - a good effort in my opinion! Elvira laybacking at the top of Texas Radio and the Big Beat. 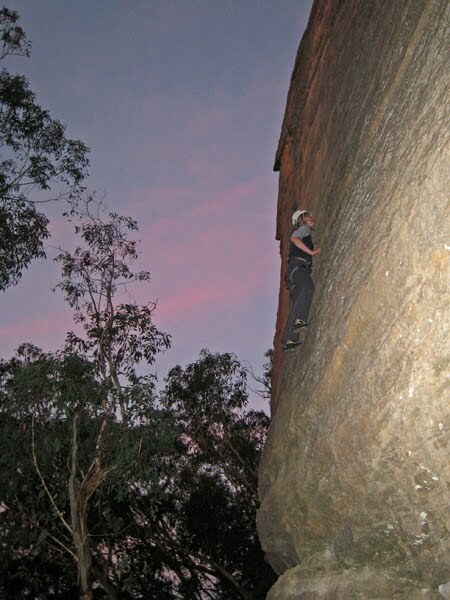 Elvira laybacking the crux start of Halfway Hotel (Australian grade 18, French 6a). 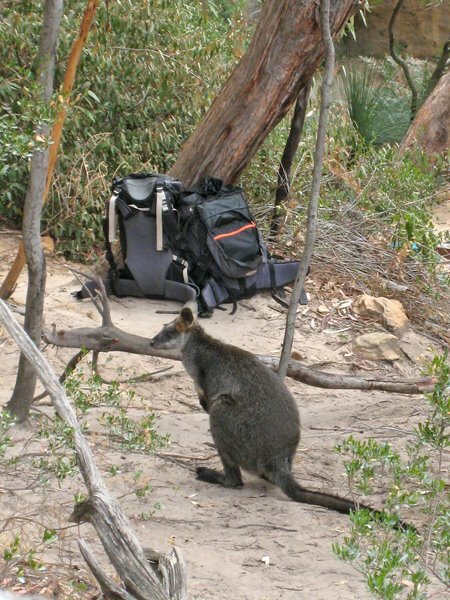 A nosy Black Wallaby looking for food near our backpacks. The Wall of Fools with the hardest routes at Sunny Day Valley. 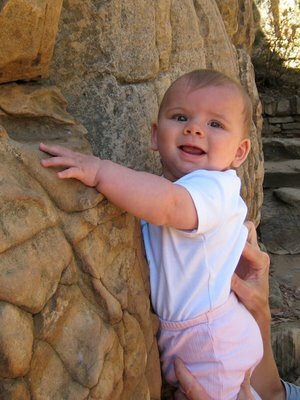 Unfortunately, the access was to rough with a baby to we did not climb any of the routes on this magnificent wall. The sandstone rock at The Watchtower does not hold the same high quality as Sunny Day Valley, but the 3 minute drive from our campground in Halls Gap made it possible to rush over there a couple of times to do a few climbs after laying at the pool all day or hiking in the National Park. 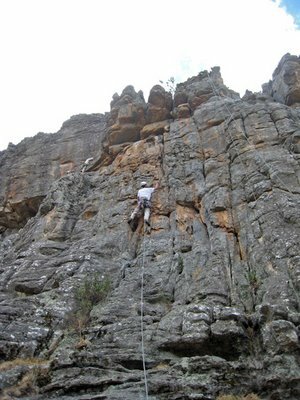 Initially we climbed the nice corner Beelzebub (Australian grade 15, French 5) which was a trad climb. 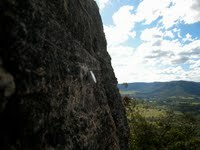 A look down the nice corner of Beelzebub (Australian grade 15, French 5). Jugular Pulse was protected with the old fashioned Australian specialty - carrot bolts - for which you need bolt plates that we didn't have at the time. 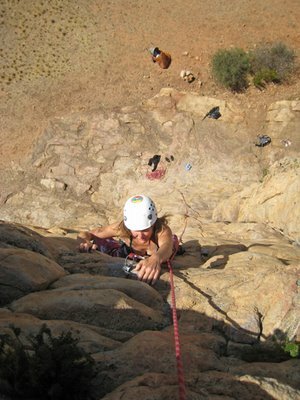 However, the routes had a shared top anchor and we could thus climb Jugular Pulse in a top rope. It was an excellent route that was significantly easier than its neighbor - too bad I could not give it an onsight attempt! Unknown Frenchman attempting Silvertop (Australian grade 22, French 6c). The logistics are thus significantly more complicated, but it should not stop you from climbing as it is definitely not an impossible undertaking!